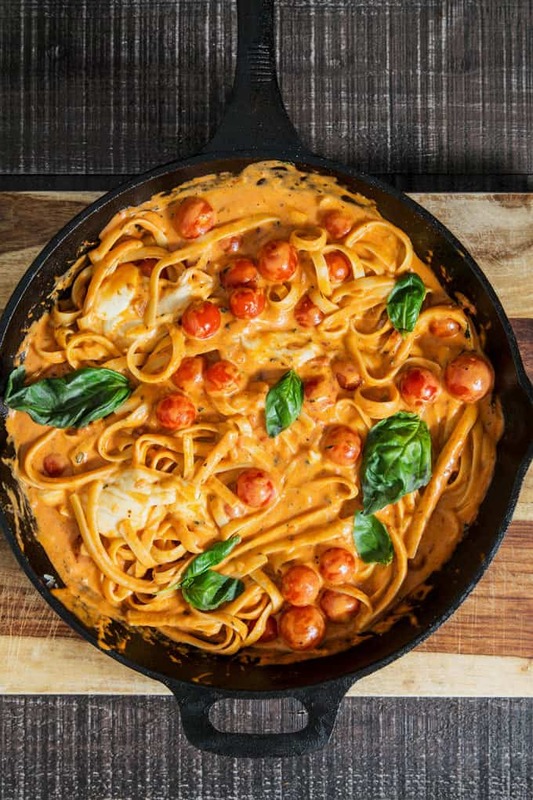 This rosa chicken caprese pasta recipe is my preferred way to combine my favorite flavors – traditional spaghetti sauce and Alfredo sauce. Use your favorite pasta and this is the perfect dinner! Caprese salad is one of my favorite menu items to order when I’m out at a restaurant. It’s relatively simple yet the flavors are out of this world. Fresh mozzarella, basil, and tomatoes goes SO well together! Want to make it more filling or a main dish? Add some chicken and pasta and you have a full meal. Do you ever cook a small portion of spaghetti sauce and then have half a jar in your fridge? I do and if you’re like me this is THE RECIPE for you. Start by cooking a pound of chicken in a large pan. I usually butterfly two chicken breasts to make this serve 4 people. When the chicken is cooked, remove it from the pan and add the pasta sauce. 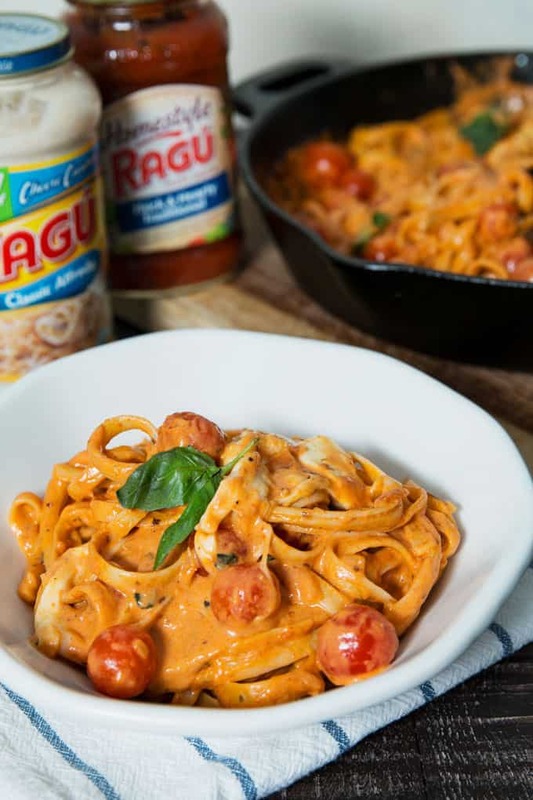 To make the rosa sauce, I used half a jar of RAGÚ® Homestyle Thick & Hearty Traditional Sauce and half a jar of RAGÚ® Family Size Classic Alfredo Sauce. 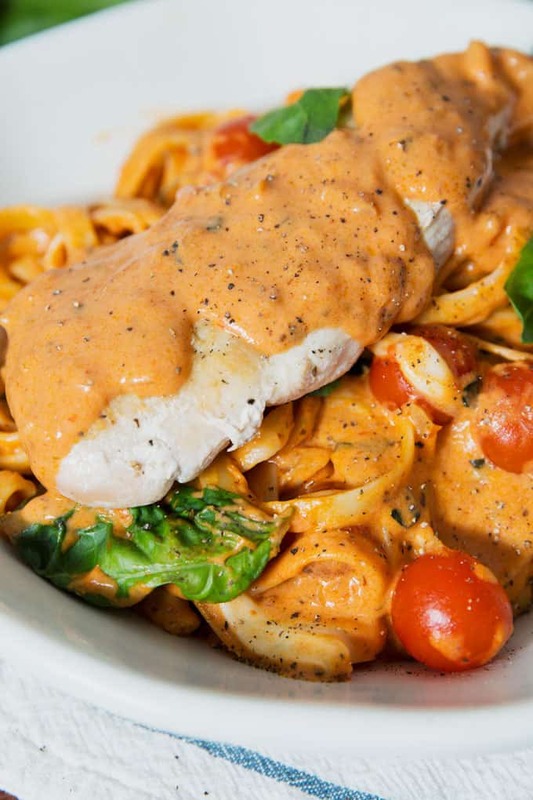 The flavors blend SO well together and create the perfect creamy, rosy sauce. RAGÚ Homestyle Thick & Hearty Traditional Sauce spaghetti sauce is a smooth, flavorful spaghetti sauce. RAGÚ Family Size Classic Alfredo Sauce is a thick, creamy Alfredo sauce that’s packed with Parmesan and Romano cheeses for a more flavorful fettuccine. It’s bursting with cheese flavor! Let the two sauces combine by giving them a really good stir. Once the sauce is a uniform color, it’s time to add the fresh mozzarella cheese, tomatoes, and fresh basil. If you want to add a little pizzaz to your dinner making, first add the cheese in a circular pattern. Then sprinkle the cherry tomatoes around the cheese. Top that with finely chopped basil and watch it cook. This pasta dish was so much fun to make – you really have to watch the video below. If you’re in a hurry or you don’t want a show, you can just add the ingredients and let them simmer in the sauce. Stir occasionally and when the cheese has melted it is time to add the pasta. I used half a box of fettuccine noodles but you could easily replace that with spaghetti, rotini, linguine or your favorite pasta! 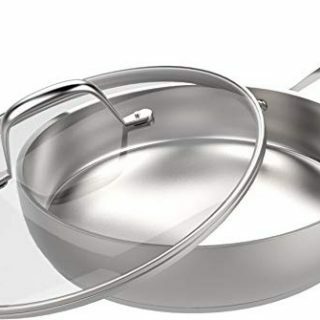 Add your fully cooked pasta to the pan and stir well. When it comes time to serve, place a portion of the noodle and sauce mixture on a plate and top with a piece of your cooked chicken. 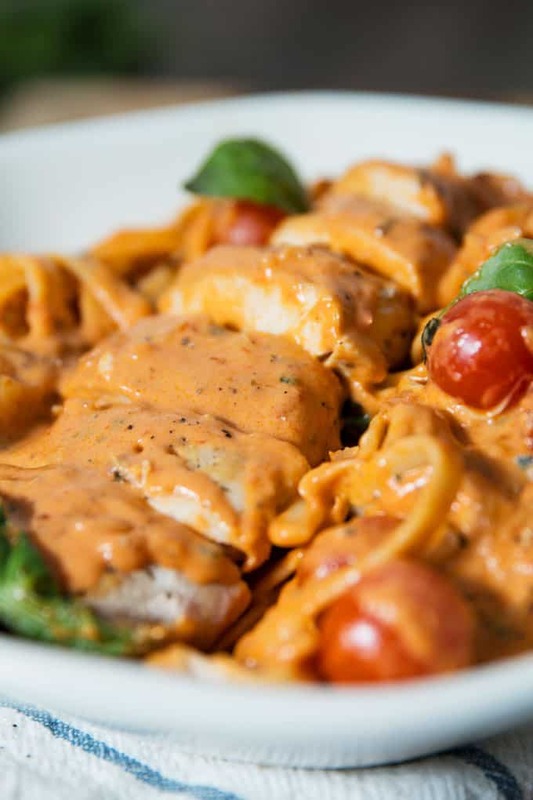 Ladle some of your rosa sauce on top – there’s no such thing as too much sauce! Top with a basil leaf or two, some black pepper, and enjoy. 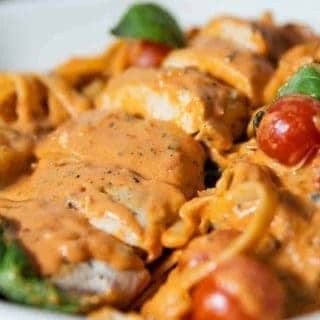 This rosa chicken caprese pasta recipe is my preferred way to combine my favorite flavors - traditional spaghetti sauce and Alfredo sauce. 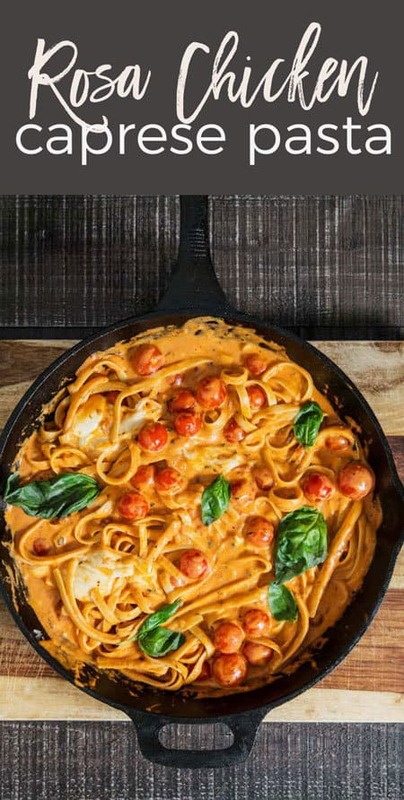 Use your favorite pasta and this is the perfect dinner! Heat a large pan over medium-high heat and add olive oil to pan. Season the chicken with salt and pepper on both sides. When the oil is hot, add the chicken breasts. Cook for 5-7 minutes on both sides, until the chicken reaches an internal temperature of 165°F. Remove the chicken from the pan and set aside. 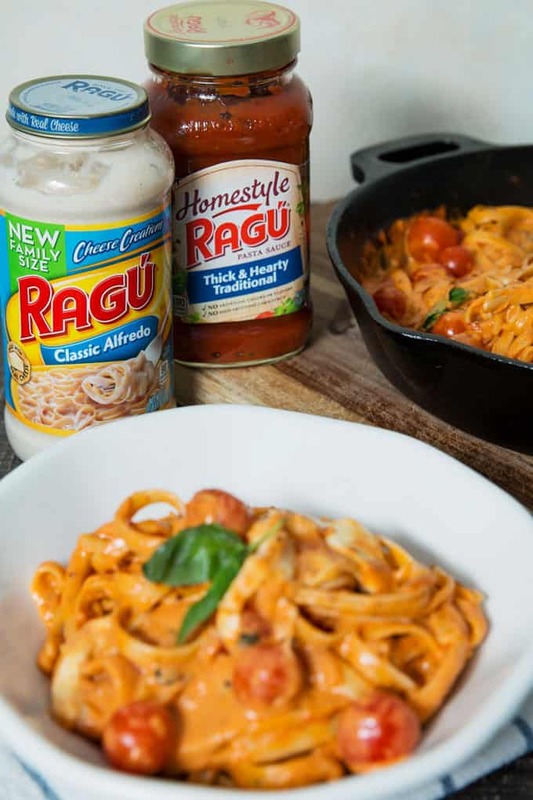 Add half a jar of RAGÚ® Homestyle Thick & Hearty Traditional Sauce and half a jar of RAGÚ® Family Size Classic Alfredo Sauce. Stir well to combine. Bring to a boil and then reduce heat so the sauce simmers. Add the cherry tomatoes, fresh mozzarella pieces, and chopped basil to the sauce. Stir occasionally and cook for 10 minutes, or until the cheese melts. Add the cooked pasta and mix into the sauce and caprese mixture until the noodles are completely covered in sauce. Turn off heat. To serve, divide the pasta onto four plates and top each plate with a cooked chicken breast. Garnish with additional fresh basil and black pepper if desired. Chicken pasta is the greatest! 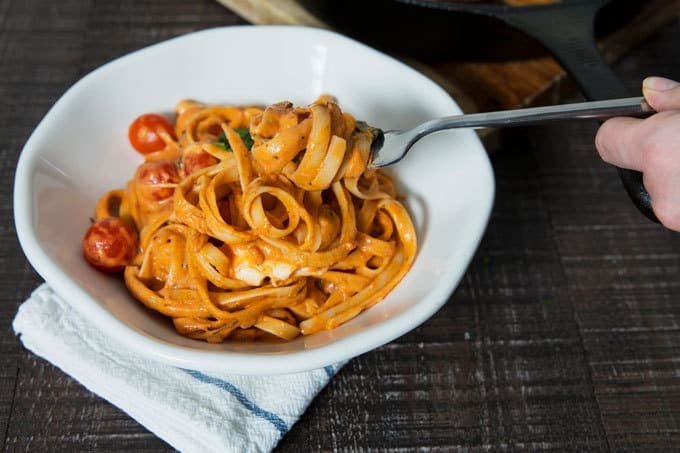 I love mixing marinara with Alfredo sauce for pasta! It makes such an easy delicious dinner! Love these flavors and how EASY it looks!! My boys love anything with alfredo so this would definitely be a hit in my house. It looks amazing! And I’m so guilty of having half open bottles of jars in my fridge! I love how quick and easy this is to make! Yummy! !